All states require students to take both a written test and an in-car driving test in order to get a driver's license. 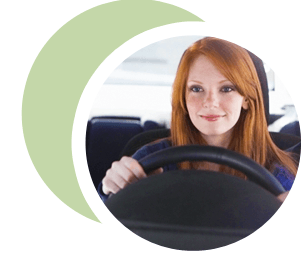 Our amazing, all-inclusive driver education DVD helps teenagers learn how to safely and effectively operate a motor vehicle, breaking down the various driving tasks into simple and easy-to-understand instructions so that teenagers are 100% prepared for the DMV driving test. A Perfect Study Tool for Teenagers, Parents & Teachers! STUDENTS: Pop-in the DVD between scheduled driving lessons to "brush-up" on what you've learned or watch the DVD the day before your driving test at the DMV. TEACHERS: Use the DVD in class to help reinforce important driver education concepts with your students. PARENTS: If you're teaching your son or daughter how to drive for the first time, this DVD can help illustrate important driving techniques before you hit the road. 3-D animations and real actors demonstrating various driving techniques. Can be played on any standard DVD player, or home or school computer. Access tons of interactive content like quizzes and cue cards using your remote control. Order our parent-approved driver education DVD and see why the DriverEdToGo DVD is the most popular driver training video on the market today! Watch Clips from the DVD! When it comes to driver education, don't leave anything to chance. Learning to drive is one of the single most important educational experiences in a young person's life because it can have a direct effect on his or her safety. Our DVD covers important topics such as how to react in the event of brake failure, how to parallel park, what to do when an emergency vehicle is approaching, and much more!